Wonderful vacation! We packed our days full of adventures and loved coming back to this charming cabin ro enjoy campfires, sunsets, soaking in the Hot Tub and making family meals together. Hands down, the best mountain views of any cabin we ever stayed at. We wanted this trip to be able to unwind as a family. We've spent a lot of time in the cabin as well as hiking and being a tourist. I love the view and the weather here. 10/10 would recommend! The cabin was very clean and the kitchen well equipped. We loved the hot tub! The cabin was a very nice property and was close to where we wanted to be. We went hiking in Deep Creek. We liked the area and location and the ease to it. Our family spent a long weekend at Harmony Hollow during Spring Break. This cabin is immaculate and everything felt brand new. Every detail was met, every need exceeded. Plenty of cooking utensils, etc. We cooked in and grilled during our stay and everything worked great! We loved s'mores over the fire pit with the kids and hot tubs under the stars. The location is quiet and feels secluded, but the drive into Bryson City or Cherokee isn't bad. Our kids (3 & 7) loved their stay! Wifi worked well for us, thankfully, since there was NO 4G up there. We would definitely stay again! Area attractions: we stopped at Anakeesta in Gatlinburg on our way into town. Pricey, but really cute. Our kids loved the beautiful treehouse playground and the gem mining. The treetops rope bridge was impressive. Hiking - Deep Creek and the waterfalls, the Road to Nowhere. Fun 1-2hr day honors, easy enough for our kids. Fishing - Coopers Creek Trout Pond. A guaranteed catch, kids loved it! Nearby - Cherokee/Oconaluftee Visitor Center, Island Park & Saunook Village. We really enjoyed our stay at cloud 10! The layout was perfect for us. We loved that there was lots of living space and the hot tub! We had a relaxing time. Our boys enjoyed zip lining and just relaxing in the Hot Tub. Watched movies and had wonderful family time. Our dog Ellie came and it was great for her too. Baby gate was a great idea for back porch. 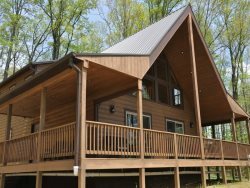 Great Smoky Cabin Rentals Rainbow Ridge Retreat is the best place we have ever stayed when visiting the Smoky Mountains. It is quiet and moderately secluded at a high elevation with a mountain view that would be pretty hard to beat. Our kids had a blast playing pool and relaxing in the hot tub. We enjoyed sitting around the fire pit and roasting marshmallows while taking in the view. The house is very clean and modern both inside and out. The internet service is actually high speed, which is a first for me when staying at such a high elevation. We will definitely be booking this rental again! The cabin is beautiful and exceeded our expectations. I was larger than we thought it would be. We loved everything about it and the space on the porch. We loved the hammock, the view and the hot tub. It was spotless when we arrived. We went hiking and fishing and truly enjoyed our Spring Break. Everything was perfect! Our favorite thing about the stay was the views. This house was even more beautiful than we expected it to be. Everyone had such a great time. We will be back soon! Our favorite thing about our stay was the cabin, Hiking, Being with friends, family and fellowship.. One night it snoe and the children has never seen snow. It was wonderful. The cabin is beautiful and cozy. It feels like an authentic home not just a rental. The view is breath taking. The night sky is amazing! Forgot the stars could be so bright. IT brought me back to my childhood. We had such a relaxing mind clearing time in the cabins. We went zip lining, hiked, mined for gems and ate at Jimmy Macs. It was exactly what we needed after spring break. The cabin is amazing, simply put. From the view which is AMAZING, to the inside of the cabin, this was by far a 1st class experience. This property is by far the best cabin we have ever stayed at. 5 stars! Our favorite was The view from the hot tub and our daily visitors, "The Deer". The property was clean and very well maintained. Plenty of room to turn your vehicle around and plenty of parking for 2 or 3 vehicles. Perfect! The team at GSCR are amazing, and always eager to take care of any questions that I have. We have stayed with two other competitors and none of them compare to GSCR! Cabin living, great views! Nice, new construction cabin, perched on top of a mountain. What an anniversary! Beautiful place. We as a family have been coming to this serene range of mountains to not only be with family but to also remember my brother Ian Cross. A Walk in the Clouds on Baines Mtn is a breath taking cabin.